In the beginning, Puncak Pass, or popularly known as Puncak, is a mountain pass connecting Jakarta and Bandung, passing through Bogor and Cianjur regencies, via areas such as Cisarua, Ciawi, Megamendung, and Cipanas. They are all connected by Jalan Raya Puncak. Puncak is located on the ridge of mount Gede Pangrango. The mountain is one of the popular national parks in Indonesia and one of the entrance to climb mount Gede Pangrango is situated inside Cibodas botanical garden. Now you can imagine the road to Puncak Pass is going up until it reaches its highest point near At-Ta'awun mosque and Puncak Pass resort. The surrounding area here is a beautiful highland covered with tea plantation and often shrouded in mist. Although parking is limited, if we are lucky to find a parking spot on the road side, we could enjoy the panorama a bit longer. There are several kiosks selling grilled corn, instant noodles, and coffees. Sometimes we can see people do paragliding from the top of the tea plantation. Cool weather and great view of Puncak Pass lure many people, especially from Jakarta, to spend many weekends and holidays here. 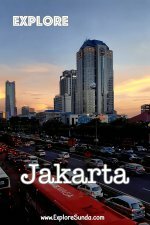 Hence, over the years it becomes the number one holiday destination in the land of Sunda. Moreover, Puncak is well known throughout Indonesia when every holiday the TV news reporters from every local channel in Indonesia report the traffic jam there. Usually multiple lines of cars are stuck for hours resulted in several kilometers queue. This is an ordinary sight during weekend, especially on long weekend and school holidays. So, what's special in Puncak? TSI is the pioneer of the wildlife park in Indonesia. The park here in Cisarua is the first safari park. TSI is a huge park filled with wild animals from all over the world. The latest members of Taman Safari Indonesia - Cisarua are two giant panda from China. They reside in a special habitat called Panda Palace. The Ranch opens in Cisarua Puncak following the success of De Ranch in Lembang. The Ranch offers a beautiful landscape, horse riding, archery, sheep herding and rabbit feeding as well as a spacious restaurant. 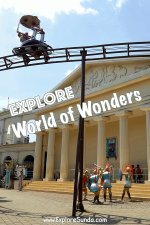 Read more about our visit to The Ranch in Cisarua Puncak here..
As a Recreation and Education Park, we can play and learn a lot in Taman Wisata Matahari. They offer many outdoor activities such as rafting, play in the waterpark, atv ride, flying fox, learn how to plow the rice field with the water buffalo, plant paddy, harvest vegetables, and many more. Curug Cilember is a seven tier waterfall located behind the crowded street from Jakarta to Puncak. Here we can enjoy nature such as big and tall trees, butterflies and waterfalls in an environment of a real forest. It is also a home for the largest butterfly garden in the land of Sunda. Gunung Mas is the name of the tea plantation in Puncak. Puncak will never be the same without this tea plantation. The view of tea shrubs looks like a green carpet. Since people love the weather and the view very much, it expands into agro-tourism by allocating some of its vast area for tourists. Telaga Warna (Colorful Lake in English) got its name since the water keeps changing color. Scientifically, the color changing is due to the algae grows in the lake. This lake is located inside a 268 hectares of nature preserve, hence, there are several types of monkey, apes, and birds lived here. Cibodas lies in the slope of mount Gede Pangrango. This 85 hectares botanical garden has huge collections of plants and a great place for picnic. Due to its high altitude (approx. 1,300-1,425 meters above mean sea level), some subtropical plants can grow well in Cibodas Botanical Garden, including the famous cherry blossom a.k.a Sakura flowers. They even can bloom twice a year! We will find lots of blooming flowers within a 35 hectares of perfectly manicured lawn of Taman Bunga Nusantara. It has plenty of topiaries, theme gardens, picnic areas, and play grounds. 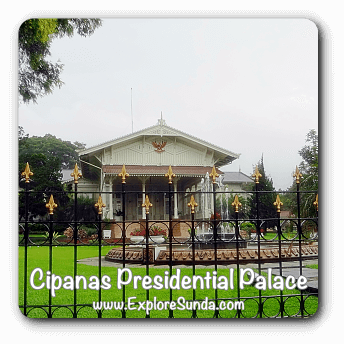 This palace is mostly used as a villa for our president, vice president and their families. The most prominent feature of this palace is it has its own hot spring water that flows through the two bath houses behind the main building. 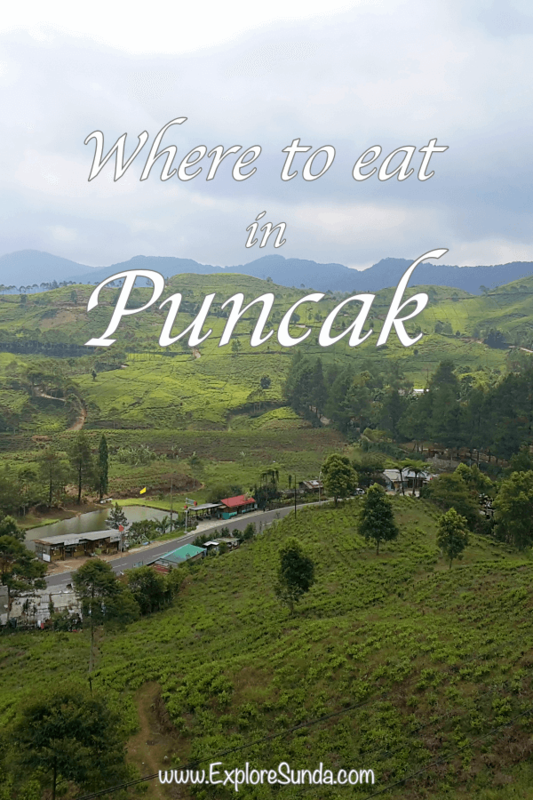 Where to eat in Puncak? There are various types of accommodations offered in Puncak, ranging from the low budget to the luxurious ones, from the high star hotels to the inn. Renting a villa is also popular in this area. You will see men standing on the roadside flagging a villa sign, it means they are ready to assist you in renting a villa nearby. Unlike hotel, there is no strict rule on how many people can use the villa you rent, but you must check the condition of the villa first. Many are already in dilapidated condition with basic facility. Do you think you will have lots of fun in Puncak Pass? Add more fun into your holiday by visiting popular beaches in the land of Sunda: Pangumbahan beach where the green turtle conservatory resides or the always popular Pangandaran beach. 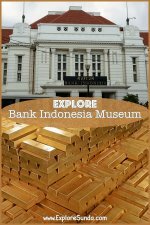 Alternatively, you will never get bored to see the rich cultures of Indonesia in Taman Mini Indonesia Indah.